Clove oil is steam distilled from the Syzgium aromaticum plant. 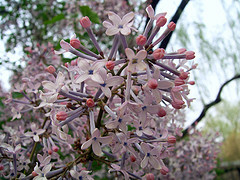 This evergreen plant grows twenty-six to thirty-nine feet tall with square leaves and colorful clusters of pink flowers. The flowers are harvested when they're red in color and less than one inch in length. They're sun dried until turning a dark brown color with a hard texture. This plant is found in Indonesia, Pakistan, India, Sri Lanka and Eastern Africa. The name "clove' is derived from the Latin word clavus, meaning nail. This oil is derived from the same Syzgium aromaticum plant, but from different locations. Bud oil comes from the plant's flower bulbs. Leaf oil comes from the plant's leaves. Stem oil comes from the plant's twigs. Eugenol is a compound in certain essential oils. It's clear to pale yellow in color with a spicy aroma. Essential oils with this compound include: clove, nutmeg, cinnamon, basil and bay leaf. CAUTION! Do not overdose! Eugenol is hepatic. It could cause serious medical problems including: liver damage, convulsions, diarrhea, nausea, dizziness, rapid heartbeat, blood in urine or unconsciousness. It can cause allergic dermatitis and skin irritations such as: itching, redness, tenderness or inflammation. CAUTION! Essential oils contain bioactive ingredients. which means their natural chemicals can interact with biological systems. They're potent chemicals and should be used with care! Never use large amounts of essential oils externally, or internally. Never use them straight. They must always be diluted in carrier oil, soap, lotion, or other buffering agent. Finally, never use them without knowing what their bioactive compounds are known to do. Consult your health care provider, if needed, before using any essential oils. RELIEVES: toothaches, strep throat, pneumonia, coughs, phlegm, bronchitis, strains and sprains. Regulates blood sugar, aids digestion, reduces fever and combats bad breath. Its antioxidants combats free radicals. It stimulates the mind and enhances concentration. Its antiseptic and anti-fungal properties are useful for treating: bee stings, minor cuts, bruises, insect bites, Athletes Foot Fungus, warts and acne. Its antioxidants combat free radical damage to skin. CAUTION! This oil is warm, hot and spicy. It can burn the skin if not diluted. Diluting to less than .75% is a must do! Caryophyllene is another chemical compound found in this oil. It contributes to the spiciness of black pepper. Studies indicate it may have anti-inflammatory properties, but further research is needed. Clove oil is a very potent essential oil! It has a warm, robust, spicy, scent with a slightly bitter edge. It combines well with other essential oils including: bergamot, citronella, grapefruit, lavender, lemon, orange, peppermint, rosemary, vetiver and yiang yiang. It can be a nice additive to any flat or dull scented homemade soaps. It would be a nice additive for making homemade soap, for men. With its antiseptic properties it would useful in a homemade soap for acne. It can help get rid of blackheads, acne or pimples. About one drop in your homemade soap recipes, is all you'll need. CAUTION! This warm, spicy, oil can accelerate trace. It can be prone to seizing your soap mixture. If you're not careful, you'll end up with a thick, soapy, mess. Prevent seizing by being consistent in soap recipes. Never substitute oils! Use the exact amount of oil specified in your soap recipe. Test fragrances or additives. Keep good reference notes. Learn how to make soap with the right specialty or soap making oil.